And…we’re back for another week of hard-hitting, halo-busting Lent Madness action! Today we have a battle between a renowned 19th century preacher and an aged Biblical figure who held the newborn Jesus in his arms. It’s “O Little Town of Bethlehem” vs. the Nunc Dimittis as can only happen in Lent Madness. This week we’ll see the conclusion of the Round of 32 and on Thursday we’ll commence with the Round of the Saintly Sixteen. To paraphrase Scripture, “Many (well, okay, 32) are called, but only one will receive the Golden Halo.” Onward Christian Voters! While in our day Phillips Brooks is best-known as the man who wrote the words to “O Little Town of Bethlehem”—and the prayer on the back of Forward Day by Day issues—in the mid-to late-nineteenth century, he was so renowned as a preacher that he was invited by Queen Victoria to preach at her private chapel at Windsor Castle. Born into a distinguished, devout family in Boston in 1835, Brooks was one of six brothers, four of whom became Episcopal priests. Educated at Boston Latin, Harvard, and Virginia Episcopal Seminary, he was ordained in 1860 and served the first ten years of his ministry in Philadelphia. He was known there for his support of emancipation and, after the Civil War, full voting rights. The sermon he preached after Lincoln’s death is still highly regarded for its eloquence. After land was purchased at Copley Square in 1872, Brooks and his friend, the architect H.H. Richardson, designed the new Trinity, a church that became one of Boston’s most magnificent landmarks. The uncommon placement of the altar in the center of the chancel embodied Brooks’s vision, which he called “a symbol of unity; God and man and all God’s creation.” Unlike most preachers of his day, he didn’t preach from a pulpit. He was also a supporter of congregational singing. 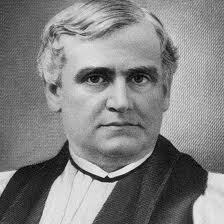 After serving as rector of Trinity for twenty-two years, Brooks was elected Bishop of Massachusetts. He served for only fifteen months before dying of diphtheria at age fifty-seven. Harvard students carried his coffin, and the people of Boston of all religious stripes mourned the passing of a great figure. O everlasting God, you revealed truth to your servant Phillips Brooks, and so formed and molded his mind and heart that he was able to mediate that truth with grace and power: Grant, we pray, that all whom you call to preach the Gospel may steep themselves in your Word, and conform their lives to your will; through Jesus Christ our Lord, who lives and reigns with you and the Holy Spirit, one God, for ever and ever. Amen. Simeon, we read in the Gospel of Luke, was a righteous and devout man living in Jerusalem. His name is the same as Simeon (Hebrew Shimon), the second son of the patriarch Jacob and his wife Leah and namesake of the Israelite tribe of Simeon. One translation of the name is “he has heard my suffering;” this meaning echoes scripture that tells how Jacob favored his other wife, Rachel, over Leah, Simeon’s mother. Lord, now lettest thou thy servant depart in peace, according to thy word: For mine eyes have seen thy salvation, which thou hast prepared before the face of all people; To be a light to lighten the Gentiles, and to be the glory of thy people Israel. When Simeon holds the infant Jesus, the ancient tribes of Israel meet the new incarnation of God. The laments of Israel are heard; the Messiah has been born and is presented in the Temple, held in the arms of the namesake of a tribe of Israel. We don’t encounter Simeon again in Holy Scripture. Tradition says he died at a very old age. Simeon is called the God-receiver in the Orthodox Church. In the Western Church, Simeon is predominant in the Feast of the Presentation (also called Candlemas) on February 2, where the Church commemorates the dedication of Jesus in the Temple by his parents. Almighty God, you gave to your servant Simeon the hope and consolation of seeing your salvation in the baby Jesus at the temple. Like Simeon, give us eyes to see your salvation, that when our day comes, we too may depart this world in peace. In the name of Jesus Christ our Lord, who lives and reigns with you and the Holy Spirit, one God, now and for ever. Amen. 154 Comments to "Phillips Brooks vs. Simeon"
I love the Christmas carol but I love the image of Simeon living long enough to hold the infant Messiah more. ” I always close my quotes. “This is so going to bother you then! Complete with score, for your devotional considersation. Thank you for posting this. It is lovely. Oh, you got my day off to a wonderful start, Mark! Never heard this one, but it is a new favorite now! Thanks for providing the music, too, so I could sing with them. My old and dear favorite is from Gibbons short service, https://www.youtube.com/watch?v=tmrjqwcsYYU. I sang this one glorious summer at Wells Cathedral. Pure bliss. My choir sang this last month, on Candelmas. Lovely. What a beautiful setting, thank you for posting this. It adds to my ever-growing list of music for my celebration of life service. I sang the Gibbons piece not long after my father died, and especially given that he was a singer also, it had a special meaning for me, but I love the Eccard also and have sung it. very nice – thanks! would love to get my choir to sing it next candlemas day! Absolutely beautiful, and lovely to have the score, so I can follow the alto line. In fact, it pushed me over the edge for Simeon. Absolutely lovely. Thank you for posting this. I have to go with Phillips Brooks. I met my husband at the Phillips Brooks club at Trinity Church, Copley Square, in 1977. 32 years of marriage and 2 kids later, I’ll always have a place in my heart for his ministry. More on Phillips Brooks by Barbara Crafton here. Helen Keller and Brooks. The story of Helen Keller and her teacher, Annie Sullivan, touched me at a very tender age. In fact their inspiring work led me to a career in special education. I appreciate Anne Fontaine’s reference to Barbara Crafton’s piece on Phillips Brooks and Ms Keller. An excellent meditation by Barbara Crafton! Brooks, a pastor who led a church that was known for evangelical warmth, diversity of classes, and charitable activism is an inspiration to every church leader, both lay and ordained. And he encouraged congregational singing! What more could you want?? The description of Brooks’ church, “known for evangelical warmth, diversity of classes, and charitable activism” and that he encouraged congregational singing win my vote today. All this sounds like my “home church” Christ Church United Methodist, at 60th St. & Park Ave. in New York City, to which my husband and I gratefully returned when I retired from active ministry as a hospital chaplain. I voted for Phillips Brooks, although I am glad to see it’s a little close. We worshipped at Trinity when we were in law school; married 36 years in May 2014. For me, the deciding factor was the example of patience on Simeon’s part, which I am in dire need of. Simeon recognized the Messiah as a baby. How many people can do that? I sing the Nunc much more than O Little Town of Bethlehem. Point for Simeon! I dearly love the Nunc Dimittis, I hope they’re my dying words. But Phillip — what a man! I think perhaps his witness will move the people of today even more than Simeon’s. Oh, what a hard choice! Simeon, born of the less favored Leah and representative of the laments of Israel; Simeon, favored by God to live to see and hold in his arms God’s own son, one born to save all humankind. The Nunc Dimittis has no parallel. What could ever parallel being allowed to live to see the dedication of Jesus in the Temple by his parents? Simeon is not the only one born of the less favored Leah. So was the Messiah Himself (Of course I’m not telling you anything you don’t know, Aleathia). Jesus was of the tribe of Judah. Leah was the wife who gave birth to Judah, not the beloved Rachel. Isn’t that just like God to do something like that? Two composers of beloved songs of praise that congregations have embraced for generations. One saint attested to by scripture and legend, and one whose life and faith has modern historical documentation. Always a tough call, but the nightly remembrance of Simeon and his wonder and joy of fulfillment have nourished me far too long for me to abandon him now. Priested on Bp. Brooks’ feast day. Didn’t know it about him, but I don’t preach from the pulpit either. “O little town of Bethlehem” is not one of my favorite hymns, however. A vote for seniors, who grow old in their devotion. I love both of these men but I have to go with Simeon because of my love for the Song of Simeon in Compline. Having recited that every day during Lent in the past and also having recited it on all mission trips with C.O.A.P. I have a deep devotion and love for that personal ‘prayer’. Bp. Brooks, aside from being a great orator and a fresh voice of his time for the church, comes from Boston. I love Trinity Church, Copley Square, and will think of him when I visit there again. As an homage to my great friend and mentor, The Very Rev. Harry Krauss, who also was schooled at VTS, and served as a priest in Philadelphia, my vote is excitedly cast for Bp. Brooks! While I admire Phillips Brooks and particularly like his emphasis on congregational singing, I have to go with Simeon on this one. We have a lot more information (including a photo!) on Brooks, but the archetypal view of Simeon as God-bearer, ancient Israel meeting the new dispensation is even stronger to me. (I know the Orthodox call him God-receiver, but as one who recognizes and accepts the Messiah, I think his title of God-bearer is only appropriate: he holds the child in his arms as he recognizes him.) Then, too, I also say the Nunc Dimittis daily, and prayed it through the night as my father was dying. Yep—gotta go with Simeon! I am so moved by Phillip Brooks personal story and his friendship with Helen Keller. thank you so much for sharing it. I love the Nunc but must vote for Brooks. “O Lord, I do not pray for tasks equal to my strength: I ask for strength equal to my tasks.”–Phillips Brooks. Love Simeon, but I am casting my vote for Brooks. Anyone who encourages congregational singing deserves my vote! As an active member of Philadelphia’s Church of the Holy Trinity, where Brooks served in Pennsylvania, and a lusty congregational singer, I vote for the man who sought to show his congregation God in the world and God in the people. Our current priest also preaches from the aisle — so his legacy lives on! I will vote for this priest too. I revere Simeon. So this vote is partially because Philip served another Trinity Church that was destroyed and recovered from fire, as our own did here in Phoenix. I’ve always loved Simeon, perhaps the sweet memory of singing his song at the end of compline.. A beautiful way to end the day. Yes, I did work at Trinity Copley Square in Children’s ministries, however, Simeon edges Phillips Brooks out a bit…. Phillips Brooks for me today. Altar in the center, diverse classes worshipping together, congregational singing, inspirational sermons NOT from the pulpit, and so much more. I have a soft spot in my heart for Simeon, because I was given his devastating monologue in a readers’ theater presentation of W H Auden’s “For The Time Being,” at my former church several years ago. What a wonderful place that was! Is there a way for us to talk off list about “For The Time Being”? I have long wanted to have our church drama group perform that, but have many questions & concerns. Brilliant. Love Auden. Simeon’s poetry too, in both Auden and Luke’s versions. Won’t be sad at all if Brooks wins today, though, because I’d love the chance to vote for him too. I just sent you a friend request on Facebook. At least I *think* it was you! Thanks to Mark D. for the YouTube references. I love “O Little Town Of Bethlehem,” and I am amazed by the things I learned about Phillip Brooks. Love the proper placement of the table, and the congregational singing, his work for abolition, etc. etc. etc.! But my heart is with Simeon. Laurie, that bio was a sermon in itself–beautifully done! I have sung the Nunc in too many evensongs (yesterday, as a matter of fact!) not to go with Simeon. The image of this elderly man welcoming the Baby in his arms is, in fact, the image I have of my own very small parish. We are aging, but there are children among us, too, and there is such equality and love among all the ages–hard to describe, but it is a very good place to be. I, too, hope to leave this life with the words of Simeon–if not from my mouth, then, please, at my funeral! The quote on Phillip Brooks about knowing Christ so personally sealed my vote and inspired my day. Thanks for including that bit in the write up. I needed to hear that today. First time voting. Phillip Brooks seemed to resonate with me. Although Simeon had a very important role. We will see if I am in the majority. Simeon saw the face of God. Phillips Brooks was a remarkable man. but I have to go with the one who held the infant Jesus. For the Dismissal, I carry the glorious infant Isabella up the aisle, to say the words. My heart is with Simeon also, MaurineRuby. I voted for Philip Brooks. My favorite cousin is active in Trinty Church but more than that was his personal relationship with Jesus, something I strive for each day. Voting for hometown boy today: Go Philip Brooks! I’d hate to go up against Simeon, so I voted for him. Phillip Brooks sound like an amazing man, but, and I’ll be happy to change my mind if corrected (state the source please,) but, from what I have read so far, he did champion voting rights for freed slaves,but only for males and I have yet to find anyhing regarding votes for women of any race. Hard choice, but I’m voing for Simeon because that has been one of my fav stories since I was a child. My mother loved “O Little Town of Bethlehem” so much that she instructed me to have it played at her funeral, no matter when she died. She died in April, and it was played. I could do no else! Good to learn more about Phillips Brooks. I don’t usually go with the modern saint who tends the vineyard so wonderfully, but in this case I must vote for Brooks, especially because of the singing that I love. My hardest vote yet. ..I grew up hearing PH as my father had him in often in his sermons.. His ministry reflected all the good things you wrote about PB..I had Dad almost 100 Years and I am 84 and I must say a long life is not for the weak. Dear Simeon gives me strength to face long dark nights yet while mortals sleep the angels keep their everlasting Love. Hi Mary Smith, thanks for posting the tidbit about Philip Brooks encouragement of congregational singing! I find that I often learn a good deal about the saints in the comments. We have a learned bunch here. Thanks to everyone! I am very fond of the nunc dimittis and we always closed our youth meetings with it. But today I have to vote for Philip because he had a church that was diverse, encouraged singing, and youth. My kind of guy. I usually lean towards the older saints, but today I went with Phillips Brooks. He did what we should all be doing as Christians, he brought people to Christ, no matter their race or social standing. Simeon place in Christian history & hearts is secure, but I had to vote for Phillips Brooks as an example of a wise & pastoral leader in the modern era. Who is this third guy so many are supporting, this Phillip Brooks? The good bishop’s name was Phillips Brooks. I often relate better to the modern saints but am going with Simeon today. He held that marvelous baby! Another really hard one. We need a split-vote option. As a teen at summer camp, I was greatly moved by the nightly singing of the Nunc Dimittis at Evensong. It has always been a comfort to me. Wow, another tough one! Beautiful write-ups both, beautiful gentlemen both, beautiful music all around (and I like Forest Green better than the usual tune for O Little Town–you just want to run to Bethlehem!). This one is going to have to soak a while, and I’m not going to check the vote before I decide…. Thanks, Heidi and Laurie. Yes, here’s to “Forest Green”!! I would love to have met Bishop Phillip, but to think that God picked Simeon to be the one to hold the infant Jesus–if that’s not a saint, I don’t know who would be. Simeon was directly chosen by God! Such a tough choice today. However, I have always had a soft spot in my heart for Simeon and Anna so he gets my vote today. (I was also Simeon’s wife in Joseph and the Technicolor Dreamcoat, but that’s a much weaker spiritual reason). “…for these eyes of mine have seen the savior. A light to enlighten the nations and the glory of your people Israel” Have to go with Simeon (and Anna)! I wonder why Simeon doesn’t appear in either Lesser Feasts and Fasts or Holy Women Holy Men. As prophetic as he was, Simeon was not an intentional disciple of Jesus. Is it right for Christians to claim this faithful Jew as our own, or does this amount to the appropriation of someone else’s tradition. I’m open to the argument that he should be included in the Christian calendar. But presumably, there’s a reason he isn’t, and I wish I understood that better before I voted. What do you mean “Simeon was not an intentional disciple” of Jesus? Simeon was told by the Holy Spirit that he would not die until he had seen the Lord’s Messiah. Read the story again in the Gospel of John! I beg your pardon, but the Nunc Dimittis is the words of Simeon praising God after holding his Lord and Savior and that he could now die in peace! Ah, but their Truth is not diminished by this exegetical information, don’t you agree? My graduate adviser at the City University of New York was Phyllis Brooks Bartlett, Fr. Brooks’s grreat niece. She was an elegant and kind woman, and I benefited greatly from her wisdom and knowledge. Of course I’d vote for Fr. Brooks!! I was going to go with Simeon (the Nunc Dimittis is an oft used and much loved prayer) but the apocryphal story of Simeon translating Isaiah changed my mind. Why do we feel the need to go beyond scripture? Just wait till we get to the round of saintly kitsch. Didn’t even try to mull this one over, I don’t think I could have chosen one over the other. Just let my finger twitch and hit Simeon, then when I saw he appeared to be the “underdog”, that became my excuse…I do love the Nunc Dimittis, tho. Really enjoyed learning more about Phillips Brooks too. This is why Lent Madness is so much fun, and so addictive! As a musician, I have no basis for decision. Simeon was the first to declare Jesus as Lord of all! And Phillips Brooks did lots of great things too, including the words to “O Little Town of Bethlehem” and introducing Helen Keller to Ann Sullivan. I ended up voting for Simeon, no basis, just a mental flip of the coin! Tough choice. I love Simeon and the idea that of all the families with little children he’d seen come and go , making the ritual offering, he was able to see that this child, born to a peasant couple, was God’s Messiah. However, I’m inclined to go with Brooks. It is sais that he wrote the fourth verse of “O Little Town”, as an outraged response to the well-heeled congregants of Trinity Copley walking by and over the poor and ragged folk who would gather to beg an offering. That, plus I serve a parish in the DioWMA where the Bishop’s chair was made for Bp Brooks when the DioMA and DioWMA were one. Anyone who sits in it looks like Lily Tomlin’s Edith Anne because their feet barely reach the floor. Phillips Brooks is a great and admirable figure and would get my vote in a second, but modern Americans are well represented in the Saintly 16 already and there are no biblical saints so far. So I’m voting for Simeon if only as a form of affirmative action. I forgot about Lydia. Oh, well. Simeon holding the Baby Jesus won me over. An easy choice. St Simeon is a character in a biblical narrative; Phillips Brooks is a saint in the usual sense. Simeon is not merely a biblical character, he confesses Jesus as Lord and Savior, the first to do so, after holding Jesus as a mere infant and is ready to die as a very old man after doing so! That is NOT being a MERE biblical character! It is quite a miracle, since he could not know except through the Holy Spirit that Jesus was the Messiah! How to pick between these two men. Both are especially deserving. Nunc dimittis is easily my favorite canticle, especially with the antiphon at the end of compline. Is there a better way to end your day? For you J. S. Bach fans, “Ich Habe Genug” BWV 82. Written for the Feast of the Purification. For all bass/baritones who usually get stuck with the “villain” role. Simeon and Anna have always been favorites. Lots of great music posts today. Very enjoyable! As for the vote, not so much. I’m conflicted. As a graduate of Virginia Seminary I had to vote for Phillips Brooks. I remember seeing his bust at the back of chapel every day. It is time we honor the good pastor and preacher. Going with Phillips Brooks, even though he himself was probably formed by the words of Nunc dimittis as I am. Another tough one, but again I went with my gut and voted for Philips Brooks. Remember that Simeon sees th baby Jesus and says he can now “depart in peace.” It was Anna who went out and actually spread the good news. I’m going with Phillips Brooks. He did so much more than write a hymn! We have a wonderful new rector at The Church of the Holy Cross. He was born in Africa, graduated from Virginia E Seminary and was a pastor in Philadelphia. Phillips Brooks’ life has links to my present. In addition our most recent pastor preached didn’t preach from the pulpit either – I liked that. Finally, I recite his prayer most mornings as I spend time with Forward. All the connections are there, had to vote for him. I agree with Jamie. Not only do I use Forward Movement, our table sits in the middle of our altar and our priest many Sundays preaches without the pulpit. Went with Philip Brooks, since we are trying to be a little more evangelical in our church and he certainly led the way!!!! Such a hard choice, but I went with Simeon. Another challenging choice. 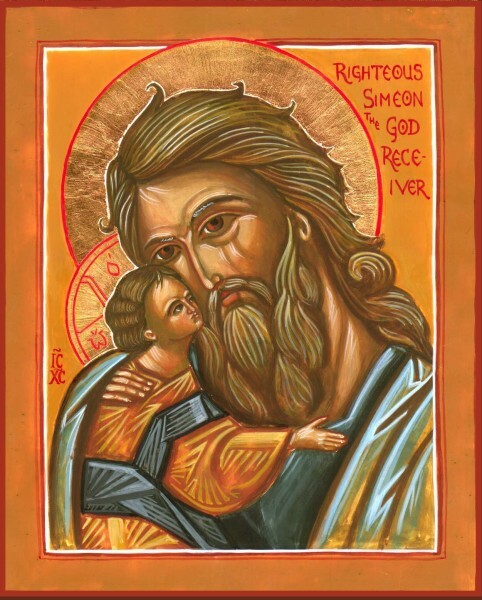 Beautiful, beloved Simeon, with a most heart tugging icon, has already secured his place in the pantheon of saints. My voting for Phillip Brooks will not diminish Simeon’s stature one cubit. Thanks for the YouTube music web sites. A lovely addition to LM. Ooops. That is PhillipS Brooks. I send you my picture as I promised, and I hope when you look at it this summer your thoughts will fly southward to your happy little friend. I used to wish that I could see pictures with my hands as I do statues, but now I do not often think about it because my dear Father has filled my mind with beautiful pictures, even of things I cannot see. If the light were not in your eyes, dear Mr. Brooks, you would understand better how happy your little Helen was when her teacher explained to her that the best and most beautiful things in the world cannot be seen nor even touched, but just felt in the heart. Every day I find out something which makes me glad. Yesterday I thought for the first time what a beautiful thing motion was, and it seemed to me that everything was trying to get near to God, does it seem that way to you? It is Sunday morning, and while I sit here in the library writing this letter you are teaching hundreds of people some of the grand and beautiful things about their heavenly Father. Are you not very, very happy? and when you are a Bishop you will preach to more people and more and more will be made glad. Teacher sends her kind remembrances, and I send you with my picture my dear love. What torture today! Choose between the author of A Morning Resolve and the author of the Nunc Dimittis! The prayers for the beginning and for the end of the day. Absolute torture! OK. OK. I vote for Simeon who held the baby Jesus in his arms and, even more importantly, recognized the Son of God. Of all the babies brought to temple, Jesus is recognized, at different moments, by two, aged, religious people. I think of Anna and Simeon as spiritual God-parents of Jesus. I was so torn over these two today. The comments helped so I am very glad I didn’t vote until mid afternoon. I am going to go with Brooks. I have a friend who sings at Trinity semi regularly. I love that he had the altar in the center and encouraged congregational singing. I sing in the choir at my church in Tallahassee and we do three evensongs a year and I love the nunc dimmitis but a more contemporary active priest from the USA is important too. Thank you so much folks for the comments, the music and the Helen Keller letter. Love the Carol and Philips Brooks is awesome, but holding the Christ child in your arms and in the heart trumps it all. I have given up trying to decide in advance (like a good little educated voter). Inevitably the Holy Spirit speaks to me in some way that totally surprises me, and I end up voting against my own filled in bracket. So there you go. Thank you Phillips Brooks for your insight and foresight. Thank you for pulling the altar out into the midst of the congregation. Amen. Had to vote for Brooks – I love the prayer he wrote that Forward Day-by-Day uses: : “O God, give me the strength to live another day . . .”. Always have a better day when I begin with Brooks’ prayer. It is a difficult choice – between a man who testified to knowing Jesus in his heart – he is there for all of us, and knowing Jesus in his hands as a babe. I voted for Simeon because I think he marks a seminal point in the preparation of the world to grow the covenant of Christ from a small land in the Middle East to spanning the entire world and half the population of this planet (in its various iterations). For me, it has to be Simeon, simply because I love the Nunc Dimittis, which is an important part of Compline. No 19th century priest can compare. As a lifetime Bostonian, though now in the suburbs, I felt naturally impelled to vote for Rev Brooks and I was also greatly influenced by reading of his great life so that I voted for him while Simeon appeared somewhat close to a mythological figure. Come on, you Simeon supporters, call your friends, call your neighbors, call your neighbors’ friends, call you friends’ neighbors, let’s get Simeon on to the next round!!! I DO love O Little Town… But I’m voting for Mr. brooks because of another great song…. Love That Dirty Water… Boston you’re my home! I think is worth highlighting. Correct me if I’m wrong, but whenever there has been a match-up between a saint who has lived recently enough to be photographed, and a saint whose likeness survives only in icon or stained glass or other medium, the one with the photo wins. What does this say about us, folks? We want assurance that the saints really aren’t vampires? Ooh, hadn’t thought of that one! I think it has more to do with more easily connecting with the more recent saints than the fact that we see real pictures of them. To have a picture means you were alive in the last 150 years or so. The invention of photography goes back to around 1800. And actually Parts of that invention go back to antiquity …..
Brooks is splendid and worthy, but the Nunc Dimittis is in my house every evening. Anyway, having lost the chance to support a man who held Jesus in his arms at the end of his life, I must give my best for a man who held him at the beginning! I thought sure that I would vote for Bishop Brooks for being a great role model, but browsing down the comments and thinking about the idea of a lifetime’s patience plus considering the beauty of holding the baby Jesus, my click went to Simeon instead. The Bostonian in me so wanted to vote for Phillip Brooks, but “Simeon is called the God-receiver in the Orthodox church” won me over. Good job, Laurie! Gotta give props to Brooks. He laid the cornerstone to our beloved Saint Johns Episcopal, Northampton, Massachustts! Go Brutha! Nothing against Phillips Brooks, “O Little Town of Bethlehem” is a lovely carol that I have probably sung every Christmas since I was a little boy (I am now 62 so that is a long time), but Simeon held the baby Jesus and declared him to be Lord and Savior when no one knew! That example of faith is clearly miraculous! I voted for Brooks as someone to emulate–which I think is ultimately what we most need from our saints. Except for the 300 pounds part. This Rev Brooks lived his life admirably but Simeon? Wow, I just see no comparison. I feel Simeon was established as a saint in our most sacred text. I’m flabbergasted he did not win hands down. I was really torn between these 2 men & tried to justify my voting one way & then the other. My conclusions are certainly not logical, but they finally worked for me. First, I’ve always been pissed that we have the Nunc Dimittis from Simeon & not a word from Anna; not either of their faults, but I warned you this isn’t logical. Secondly, Phillips Brooks lived in a very difficult historical period & negotiated politically hot potato issues well & still was elected bishop. But primarily, I think “O Little Town of Bethlehem” is one of the finest examples we have of narrative theology in our hymnody, & I really wish he’d written some more. First, it is Phillips Brooks, NOT Phillip (which is a misspelling of Philip), NOT Philip (the correct spelling, like the Apostle), but Phillips — a use of a last name as a first name! 36 There was also a prophet, Anna, the daughter of Penuel, of the tribe of Asher. She was very old; she had lived with her husband seven years after her marriage, 37 and then was a widow until she was eighty-four. [e] She never left the temple but worshiped night and day, fasting and praying. 38 Coming up to them at that very moment, she gave thanks to God and spoke about the child to all who were looking forward to the redemption of Jerusalem.” John 2:25-38 Unfortunately, some of the misreadings of the story of Simeon may have been persuasive, even though wrong! I know, my mistake, I meant Luke! I was so upset with people calling Simeon a “mere biblical character” and even mythological that I typed the wrong thing! I know what you mean! I don’t understand that line of thinking at all. It’s why I posted my question on why the saints with photographs win out over the ancient ones. (I’m still reeling from Joseph of Ar.’s loss!) Ah well. Everyone’s heart is in it, and it’s interested how we all–even in this group of relatively like-minded folks–can feel so passionately different about things. Vive la différence! Sorry, my mouse sometimes clicks twice when I click once, and I keep getting double postings — I thought this site guarded against that?! Anyway, the whole point of Simeon’s story is that he pointed out to Mary and Joseph and the entire crowd at the temple that this baby was the promised Messiah, our Lord and Savior! Anna responds to hearing that by telling everyone around her! And Simeon is about to depart this life (“Now lettest thou thy servant depart in peace”) and Anna is very old too. Neither one was going to live long enough to see or hear any of Jesus’ ministry. Yet years before that they declare Jesus as Lord and Savior. Absolutely remarkable! And I too am reeling from Joseph of Arimathea’s loss. Again there is more to it than merely providing the tomb. At the time Jesus’ followers were worried about the Roman soldiers engaging in “funny business” about Jesus’ corpse and vice versa, the Romans were worried that some of Jesus’ followers were going to make the body disappear so they could then declare “see he was resurrected as he declared he would” when that was not the case at all. Only by having a trustworthy person like Joseph put Jesus in the tomb after proper preparation could there be any assurance of the miracle of resurrection that was about to take place! Even then there were a lot of questions — not indicated in the Gospels per se — about what had happened. Some of Jesus’ followers thought that the Romans had done something, and the Romans were sure that Jesus’ followers were pulling something! Joseph is, therefore, a key part of the resurrection, not just a “minor” character. Yes, it bothers me that he lost! And BTW St. Simeon’s Day is February 3, the day after Candlemas or the Presentation of Our Lord! The Presentation of Jesus in the Temple took place on a Sunday this year (a real treat for those of us who don’t get to weekday feasts), so it was good to hear the Simeon story and the Nunc in their biblical context.